Boosting the energy efficiency of your home is a real no-brainer. It makes your home more comfortable (the right temperature at the right time), reduces your bills, and helps the environment. Sadly, most people are too concerned about hassle or cost to actively look into how to do this. The good news is that upgrading your home doesn’t have to be a single massive project. There are tons of things you can do, both big and small. Plus, many of these upgrades have great side benefits, like helping to prevent home water damage. Next time it’s nice and cold outside, go feel your windows. They’re going to feel cool at the least, but if they feel very cold, chances are you’re losing a lot of heat through them. This is particularly true of older single pane windows. This is a fairly big project, but replacing all of your home’s windows can save you hundreds of dollars a year. Plus, your home will feel warmer in the winter and cooler in the summer – who doesn’t like feeling comfy? You already know that using your home’s heating and air conditioning (HVAC) system properly (cooling your house at night and when you’re not at home, turning the air conditioning off while you’re on vacation) will save you money on energy bills. But what you may not have known is that the latest generation of smart home thermostats will do that automatically. Devices like the Nest Home Thermostat learn your behavior and automatically figure out the most efficient way to operate. This is one of the cheapest and easiest home energy efficiency solutions. Devices that can work together with a smart home thermostat, like ceiling fans and blinds, can further control the temperature and energy usage of your home for optimal comfort and cost savings. 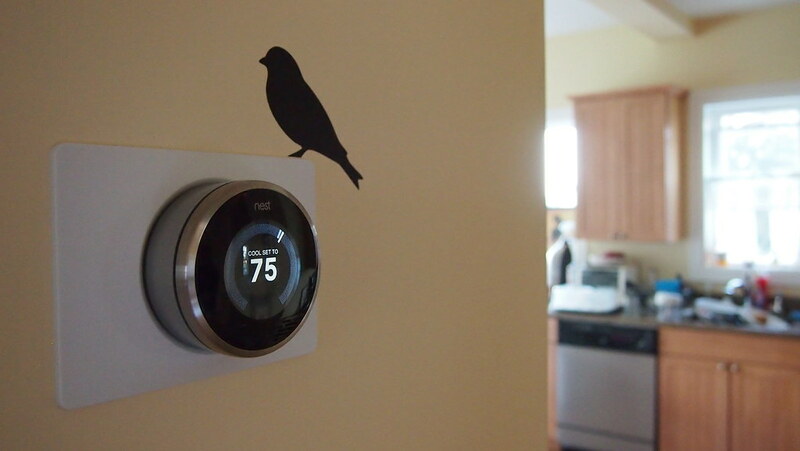 Look into what devices can work with your thermostat and see how much you can save. This is another real no-brainer. Added ceiling and attic insulation helps trap heat in the winter and cool air in the summer. The US Government estimates this can save you an average of 15% on your heating and cooling costs. That adds up to serious savings. So break out the ladder, and see if there are improvements you could make. Now we’re into appliance territory. With a tankless water heater, there’s no doubt that it will save you money on your energy bills. But, due to its high cost (an average of around $1,500), it will probably take you a long time to make it up in savings. Still, there are other definite benefits. You’ll never run out of hot water (perfect for bigger families), and it dramatically reduces the risk of a flooded basement. If you’ve thought about installing solar panels in the past but decided against it due to the cost, there’s good news. Solar panels are cheaper than ever, even more so with the increasingly common tax incentive programs for them – along with the many other upgrade incentives available. These kinds of tax credits don’t last forever, so now could be a great time to invest in solar power. We’ve mentioned tankless water heaters, but nowadays, the handy Energy Star label can be found on everything from dishwashers to refrigerators. That’s just the start. You can also check review sites like CNET to get detailed information about water and electricity usage, so you can find appliances that won’t break the bank long after you’ve bought them. If you’re still buying incandescent light bulbs because they’re “cheaper”, then I’ve got some bad news. They cost far more in terms of both lifespan (they don’t last very long) and energy usage (they’re far less efficient than fluorescent bulbs). So next time you’re replacing a bulb, remember that the slightly higher price tag isn’t the whole story. This is one home energy trick most people just don’t consider. But planting trees can also save you on your energy costs (in addition to making your yard look beautiful). During the summer months, those big green leaves will absorb direct sunlight and its heat, cooling down your house. Then, during the winter, those leaves will be gone and you’ll get that warm sunlight for the whole season. If your air filters are dirty, your HVAC system has to work that much harder to push air through them. That makes your entire system less efficient, meaning your home is less comfortable and your wallet is that much lighter at the end of the month. So make sure to set a reminder to replace your air filters regularly (check the packages for details of times). There’s Even More You Can Do! Home improvement doesn’t start and stop with efficiency. Today, there are more products than ever to make your home smarter and safer. Take home water leaks: A tankless water heater might help, but a smart home leak detection system can help make them a thing of the past. Cleaning up from a flood or replacing walls after a major leak just isn’t efficient, so consider preventing home water leaks before they start.